I've been enjoying being a little more crafty recently so when I saw Talented Talkers tweet looking for people for a craft challenge I put myself forward. They got in contact with me to let me know that they were working with George at Asda on a campaign called #ThatsSewGeorge (see what they did there!). George would send you some of their bedding and the challenge was to make something from it. As much as I love pretty bedding I don't like to spend a lot of money on it and George is definitely one of the places I look to for reasonably priced bedding with pretty prints. I got to pick the print I wanted and George kindly sent me two of their Damask duvet sets in grey; one to make something from and one for me to use as a duvet set. After finding inspiration on Pinterest (this happens a lot at the moment!) I decided what I wanted to make, but then as I've already mentioned something went wrong. I'll explain why. As you can see in the picture above I originally intended to use white elastic that I already had to make the note board. When I came to make the board I discovered that I didn't actually have enough elastic. I obviously could have bought more, but the problem was I'd run out of time and needed to make it there and then, so I had to compromise. 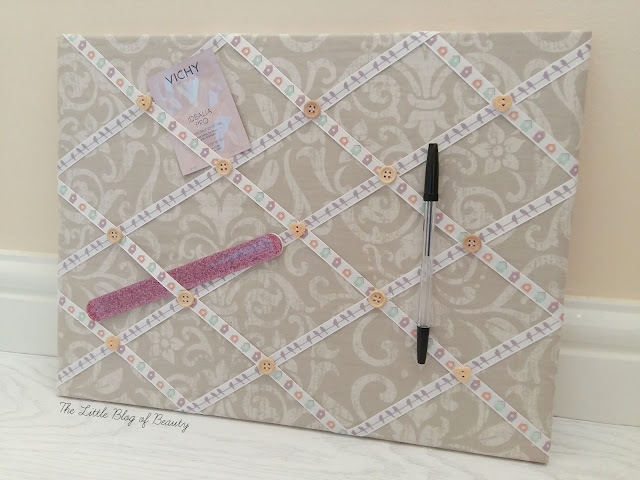 When I bought the cork board to make this I saw some pretty ribbons with different patterns/images on them and as they were reasonably priced I bought a couple thinking I might use them. I later decided that with the patterned background, having images on the ribbons would make the board look far too busy, so I decided to go with the elastic I already had at home. When I then discovered I didn't have enough elastic this meant I had to resort to using the ribbons. If I hadn't bought the ribbons then I'd have had a complete melt down I'm not sure what I would have done. Although I really don't like how this has turned out I do still really like the idea of the board, so I'll tell you how to make it. My pin board was from Wilkos and was just £2 and the two packs of ribbon where also from Wilkos and were £2 each. The buttons came from Hobbycraft but I didn't like any of the pre-packaged ones so ended up getting these really cute wooden buttons from the bead section and filling up a little pot for £3.50. I have no idea how much a staple gun costs as I made sure dad had one before I decided on doing this and just pinched his. I have to admit I was a little cautious about using a staple gun after a incident many years ago when I was visiting my brother in hospital after one of his many asthma attacks. My parents had bought me a stapler on the way in to visiting him and while playing around with it while sitting next to his hospital bed I managed to staple my thumbs together! I'm pleased to report that on completion of this project all body parts were completely free from staples. Here is the finished product, see what I mean about it being too busy? It would have looked so much better with just plain ribbon or elastic. I'm afraid I don't have step by step pictures for this as I had to do it in the evening when it was dark, but I'll talk you through the steps. Take your board and use it to measure out a rectangle in your fabric that is large enough to wrap around the outside of the board and secure on the back. I used a pillow case from the duvet set and just cut off the back and trimmed it down a bit. As you'll be sewing the buttons to the ribbons/fabric you'll need to do this before you secure the fabric to the board. Unfortunately this really isn't easy! 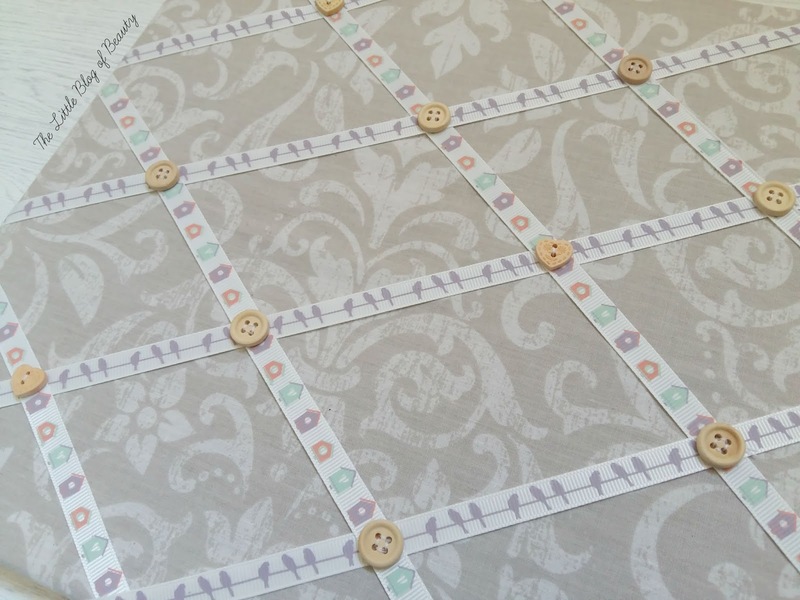 It's best to lay the fabric over the board so you have an idea of where the edges are, lay your ribbons out where you want them, pin in place and trim the ends leaving enough to curve round the edges of the board to secure on the back. Once your ribbons are in place sew a button on each point where the ribbons cross. Once the buttons are all sewn in place remove all the pins and turn the board over, taking care to keep the fabric in the right place. Don't worry about the ends of the ribbons at the moment as the ribbons are sewn in place. Working on one edge at a time pull the fabric around the board tight (making sure you don't shift the positioning of the fabric when doing the first edge) and secure on the back with staples (keeping all fingers, toes and limbs out of the way!). Once all sides of the fabric are secured on the back of the board, take the ends of each piece of ribbon and making sure they lay flat on the front of the board curve around the edge of the board and secure on the back with a staple. I know, I know, my spacing is out but I think I was so frustrated that I was having to use the ribbon rather than elastic that I kind of gave up. Although I didn't really want to use the ribbons they're definitely very pretty. One has birds sat on a wire and the other has little bird houses on. 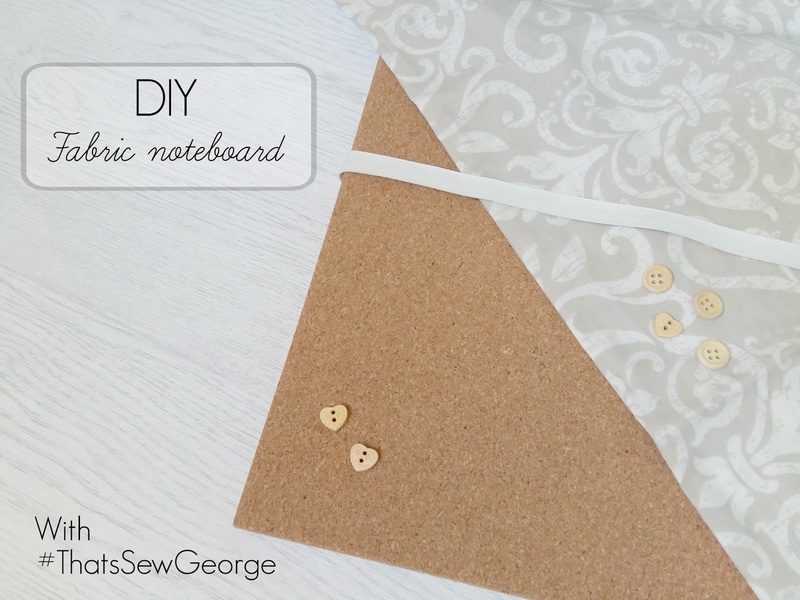 The idea is that rather than pins you use the ribbon/elastic to attach items to the board. This could be business cards, notes, pens, glasses, sample sachets, anything really that you might want to know the location of. You could even store your hair grips on there to try and stop them slipping into that parallel universe where grips go to annoy us. You can find George's very pretty bedding, including the Damask set that I've used here, in Asda stores and on the Asda website.